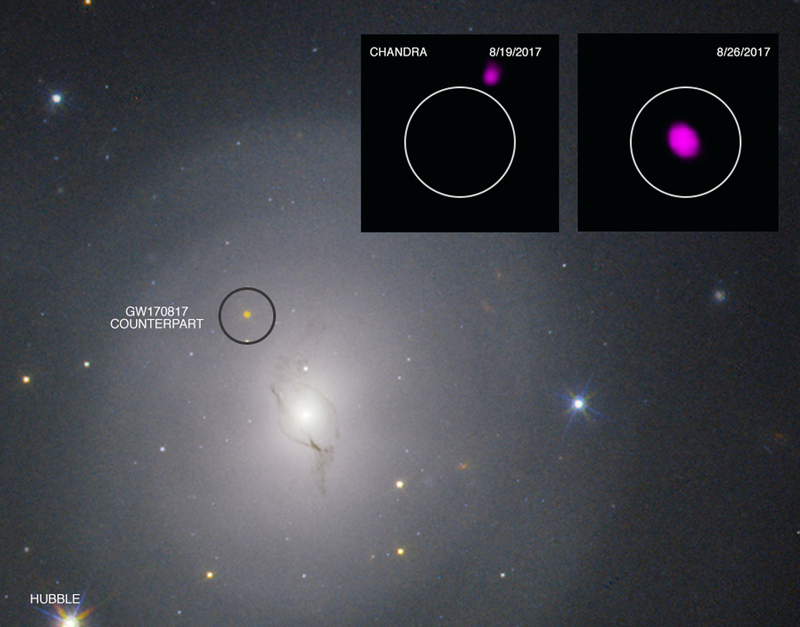 Astronomers have used Chandra to make the first X-ray detection of a gravitational wave source. This is the first evidence that the aftermath of gravitational wave events can also emit X-rays. The data indicate this event was the merger of two neutron stars that produced a jet pointing away from Earth. Chandra provides the missing observational link between short gamma-ray bursts (GRBs) and gravitational waves from neutron star mergers. Astronomers have used NASA's Chandra X-ray Observatory to make the first X-ray detection of a gravitational wave source. Chandra was one of multiple observatories to detect the aftermath of this gravitational wave event, the first to produce an electromagnetic signal of any type. This discovery represents the beginning of a new era in astrophysics. The gravitational wave source, GW170817, was detected with the advanced Laser Interferometer Gravitational-Wave Observatory, or LIGO, at 8:41am EDT on Thursday August 17, 2017. Two seconds later NASA's Fermi Gamma-ray Burst Monitor (GBM) detected a weak pulse of gamma-rays. Later that morning, LIGO scientists announced that GW170817 had the characteristics of a merger of two neutron stars. During the evening of August 17, multiple teams of astronomers using ground-based telescopes reported a detection of a new source of optical and infrared light in the galaxy NGC 4993, a galaxy located about 130 million light years from Earth. The position of the new optical and infrared source agreed with the position of the Fermi and the gravitational wave sources. The latter was refined by combining information from LIGO and its European counterpart, Virgo. 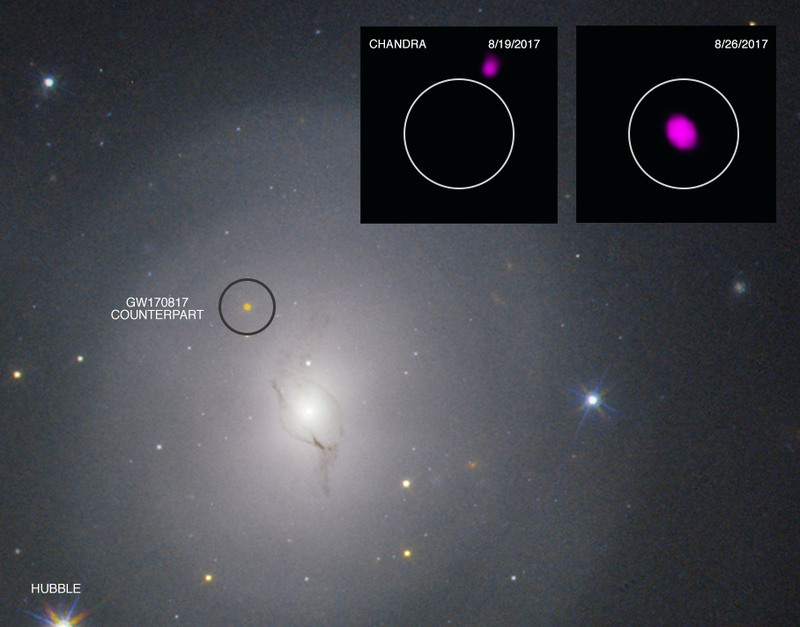 Over the following two weeks, Chandra observed NGC 4993 and the source GW170817 four separate times. In the first observation on August 19th (Principal Investigator: Wen-fai Fong from Northwestern University in Evanston, Illinois), no X-rays were detected at the location of GW170817. This observation was obtained remarkably quickly, only 2.3 days after the gravitational source was detected. On August 26, Chandra observed GW170817 again and this time, X-rays were seen for the first time (PI: Eleonora Troja from Goddard Space Flight Center in Greenbelt, MD, and the University of Maryland, College Park). This new X-ray source was located at the exact position of the optical and infrared source. "This Chandra detection is very important because it is the first evidence that sources of gravitational waves are also sources of X-ray emission," said Troja. "This detection is teaching us a great deal of information about the collision and its remnant. It helps to give us an important confirmation that gamma-ray bursts are beamed into narrow jets." The accompanying graphic shows both the Chandra non-detection, or upper limit of X-rays from GW170817 on August 19th, and the subsequent detection on August 26th, in the two sides of the inset box. The main panel of the graphic is the Hubble Space Telescope image of NGC 4993, which includes data taken on August 22nd. The variable optical source corresponding to GW170817 is located in the center of the circle in the Hubble image. Chandra observed GW170817 again on September 1st (PI Eleonora Troja) and September 2nd (PI: Daryl Haggard from McGill University in Montreal, Canada), when the source appeared to have roughly the same level of X-ray brightness as the August 26 observation. The properties of the source's X-ray brightness with time matches that predicted by theoretical models of a short gamma-ray burst (GRB). During such an event, a burst of X-rays and gamma rays is generated by a narrow jet, or beam, of high-energy particles produced by the merger of two neutron stars. The initial non-detection by Chandra followed by the detections show that the X-ray emission from GW170817 is consistent with the afterglow from a GRB viewed "off-axis," that is, with the jet not pointing directly towards the Earth. This is the first time astronomers have ever detected an off-axis short GRB. "After some thought, we realized that the initial non-detection by Chandra perfectly matches with what we expect," said Fong. "The fact that we did not see anything at first gives us a very good handle on the orientation and geometry of the system." The researchers think that initially the jet was narrow, with Chandra viewing it from the side. However, as time passed the material in the jet slowed down and widened as it slammed into surrounding material, causing the X-ray emission to rise as the jet came into direct view. The Chandra data allow researchers to estimate the angle between the jet and our line of sight. The three different Chandra observing teams each estimate angles between 20 and 60 degrees. Future observations may help refine these estimates. The detection of this off-axis short GRB helps explain the weakness of the gamma-ray signal detected with Fermi GBM for a burst that is so close by. Because our telescopes are not looking straight down the barrel of the jet as they have for other short GRBs, the gamma-ray signal is much fainter. The optical and infrared light is likely caused by the radioactive glow when heavy elements such as gold and platinum are produced in the material ejected by the neutron star merger. 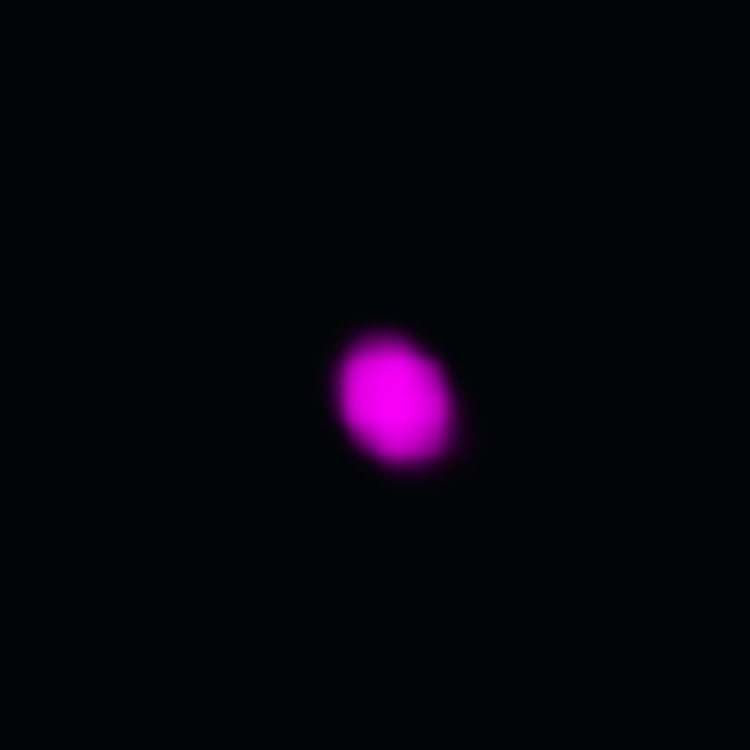 This glow had been predicted to occur after neutron stars merged. By detecting an off-axis short GRB at the location of the radioactive glow, the Chandra observations provide the missing observational link between short GRBs and gravitational waves from neutron star mergers. This is the first time astronomers have all of the necessary pieces of information of neutron stars merging — from the production of gravitational waves followed by signals in gamma rays, X-rays, optical and infrared light, that all agree with predictions for a short GRB viewed off-axis. "This is a big deal because it's an entirely new level of knowledge," said Haggard. "This discovery allows us to link this gravitational wave source up to all the rest of astrophysics, stars, galaxies, explosions, growing massive black holes, and of course neutron star mergers." Papers describing these results have been accepted for publication in Nature (Troja et al. ), and The Astrophysical Journal Letters (Haggard et al. and Margutti et al.). Raffaella Margutti is a collaborator of Fong's, also from Northwestern. Coordinates (J2000) RA 13h 09m 48.1s | Dec -23° 22´ 53.4"
At the moment, it is unclear as to whether the merger has produced a black hole or something else. Future observations will continue to help us understand what has happened here. Amazing. Glad I am on your list. Thank, you very much. Would not the merger of two neutron stars result in the formation of a single black hole? I'm glad this is all coming together. Congratulations on your observations and early conclusions. I am assuming Swift finds this kind of "burst" below the trigger to swing it to observe an object this far off axis so that it's intensity is below what Swift can detect. Yes, the fusion of two neutron stars producing waves of aberration called gravity waves rather than the fusion of two esoteric holes as a result of this wave. The first X-ray detection of a gravitational wave source. About 130 million light years from Earth. X-rays from the Chandra X-ray Observatory and optical data from Hubble. The inset images are each about 0.1 arcmin across. X-rays are purple. Optical data are red, green, and blue.